We visited Glendevon Primary and Junior High School on Monday, January 11, 2016, where we officially started off our End Bullying Program with a Devotional exercise, officiated by team member Ms. Sanjay Brown. 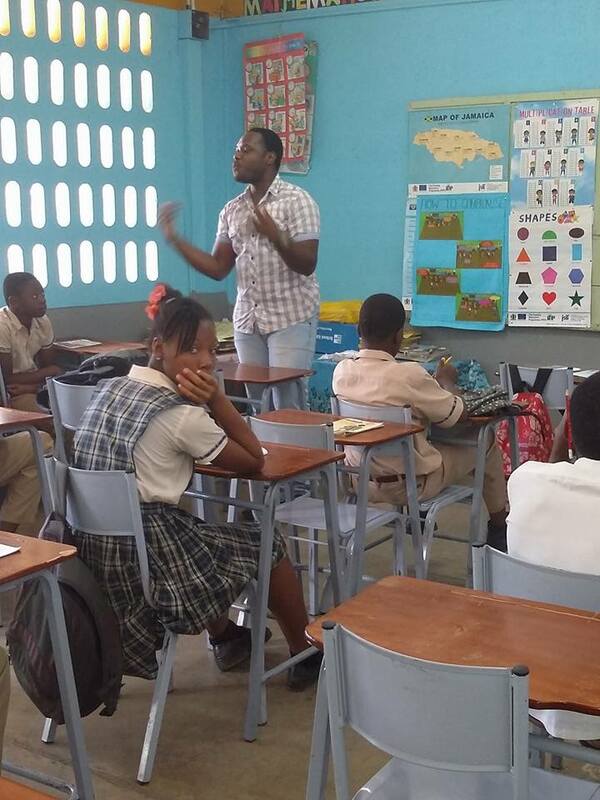 Le Antonio’s Foundation Youth Coordinator Mr. Odane Reid spoke to the students about Bullying during this period. After the Devotion we visited some of the classrooms in grades three, Four, five and Six and A-Step classes to continue speaking with the students about Bullying and its effects on our Youths. We concluded this campaign day by meeting with the principal and guidance counselor. Our next visit was at Salt Spring Primary on Tuesday, January 12,2016. The team started off the day at Salt Spring Primary School with a Devotional exercise conducted by Ms. Sanjay Brown, followed by team member Nickolla Barnett who spoke to the students about Bullying. After the Devotion we gifted the students with pencil. The team then visited grade three, Four, Five and Six to continue speaking to the students about Bullying. We ended our day at Salt Spring Primary in a meeting with the Principal who shared a few pointer with us. On Wednesday, January 13, 2016 we visited the Mount Salem Primary and Junior High School to carry out a Devotional exercise on “Bullying.” The meeting was conducted by Mr. Odane Reid and Ms. Sanjay Brown. However, on the advice of the School’s principal we did visit any classrooms. We were advised to make appointments to return to the school for the classroom setting. We will be returning to Mount Salem Primary and Junior High School to conclude this event at a later date. This event concluded by us giving the Principal pencils be handed out to the students. On Friday, January 15, 2016 we visited the Flankers Primary and Junior High School and begun our campaign there with the Devotional exercise conducted by Mr. Odane Reid, and Ms. Nadine Barrett. Our Youth Coordinator, Mr. Odane Reid spoke to the students about Bullying and the effects it can have on them or their peers. After the Devotional exercise ended, Mr. Reid and Ms. Barrett visited the classrooms in grades three, four, five, six and A-Step classes to continue speaking on Bullying and its effects on Youths. We ended our day at Flankers Primary and Junior High School by handing out gifts of pencils to some of the students.